Motion Picture Rating (MPAA): Not rated. Runtime: approx. 100 minutes per episode. Once again, there are only 3 episodes in this set. It seems a bit pricey for a mere three episodes; and mediocre episodes at that, but quality is not considered when setting the price. I also had the displeasure of pre-ordering Set #24 on the first day available through Acorn only to receive a notice as the release date approached that delivery was back-ordered and would be delayed because of the over-whelming demand for the DVD. Silly me, I thought pre-ordering was meant to give the company a reasonable idea of how many DVDs would be needed and that those pre-ordering should get said product when it was released. However, Acorn used the same “pre-order…sorry we don’t have enough to go around” gambit when I pre-ordered the latest New Tricks DVD and the latest Poirot DVD. I should have saved myself money and just waited until the DVDs were available elsewhere. Pre-ordering at Acorn doesn’t even assure you of getting a DVD when it is released. You sometimes have to wait weeks. "Written in the Stars" — A killer seems to be targeting members of the local amateur astronomical society. A local astrologist claims to have predicted two of the murders. Meanwhile, D.C.I. Barnaby is trying to understand the killer’s signature while D.S. Jones is muddling about. I wonder why Mrs. Barnaby is taking a yoga class in Midsomer Stanton, near Moonridge, the site of the first murder, which occurred during a total eclipse? Several of the local female characters are also in the class but Mrs. Barnaby has no real connection to any of them. The situation seems contrived, as if the writers couldn’t figure out anything constructive to do with Mrs. Barnaby and/or else they couldn’t figure out a more interesting or suspenseful way to get the information from the female characters to the viewers. "The Sicilian Defence" — In Bishopwood, the annual chess tournament is in progress. A young girl who has been in a coma for a year wakes up. Everyone wants to know what happened to the young boy she was eloping with the night she was attacked in the woods and left in the coma. Some believe he is dead; others hope he is alive and just ran away. Corpses soon begin to turn up with cryptic, chess-related messages. The title refers to a supposedly famous chess game related to the plot. My husband who enjoys playing chess slept through most of this episode. I found the storyline overly convoluted, boring, and filled with unsympathetic characters. I can’t think of one single character I felt shouldn’t have been killed off except D.C.I. Barnaby and D.S. Jones. But wait, is this series becoming a comedy? Midsomer Pastures?!? Whose idea was it that Midsomer Pastures was a good idea for the name of a school or a village? A retirement home by that name, perhaps. A village or school? Please! Talk about a boring plot, unsympathetic characters, and my secretly wishing the entire cast (again, except for D.C.I. Barnaby, D.S. Jones, and Sykes, the dog) could have fallen victim of the killer, who then followed up by committing suicide, this is the episode. I can’t think of any qualities about this episode that I didn’t find irritating or grating. The storyline was simply flat. Even the setting was boring. Well, I did like the cows. The Midsomer villages depicted in Set #24 no longer feel like Midsomer villages. 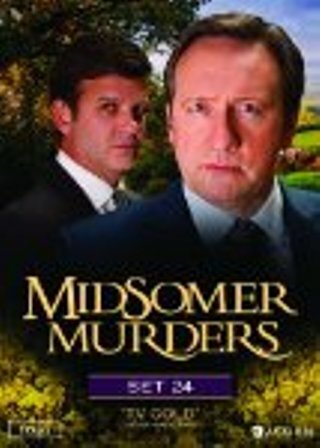 As some will know, producer Brian True-May was criticized for not having enough people of color and not enough ethnic diversity in his portrayal of Midsomer Murders. His response indicating that the villages of Midsomer were essentially fantasies, and that no quaint, cozy villages existed today, was dismissed. He was replaced by producer Jo Wright who brought along the here-to-for missing actors of color and ethnicity to Set #24. For some, the subtle shift may not be as jarring as it was to me. I’m not against actors of color; I just agree with Brian True-May, Midsomer Murders is not about real life or real villages. It’s about an English countryside that doesn’t exist anymore. Combined with plots that are more convoluted than necessary, unsympathetic characters, and the compulsion to add ethnically diverse characters, the shift has resulted in Midsomer Murders becoming just another mediocre cop show. I am not looking forward to actor Jason Hughes’ (D.S. Ben Jones) departure in the next set of episodes. In the future, I will be content to watch earlier episodes from this series, in which repeated viewing enhances the enjoyment of the tale rather than send me screaming from the room in frustration.